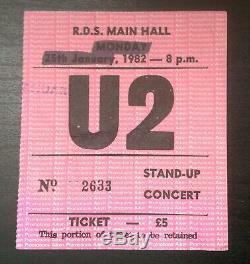 Original and very early U2 Concert ticket when they played here, in their hometown of Dublin, Ireland in January 1982. The venue was the famous Royal Dublin Society known locally as The RDS. This concert formed part of their "October Tour". The tickets were released with the wrong date printed on them of Monday 25th January, 1982. The actual date the concert took place was the next day the 26th of January, 1982. The promoters used a black felt pen to block out the date and issued the tickets as you see this one. This was the first time they played "Tomorrow" live. I have owned this ticket stub from new and was obviously at the gig. I have seen U2 many times, but its time to sell some items now. Ticket size is 3.5 inches x 4 inches and is blank on the reverse side. Please see my feedback for comfort. This ticket stub would make a great center piece in any fans collection. A hometown ticket from very early on in their history. The item "Rare U2 Dublin Concert Ticket Stub 1982 October Tour" is in sale since Saturday, March 16, 2019. This item is in the category "Music\Music Memorabilia\Rock\Concert Memorabilia". The seller is "brendelaney" and is located in Sandyford, Dublin. This item can be shipped worldwide.